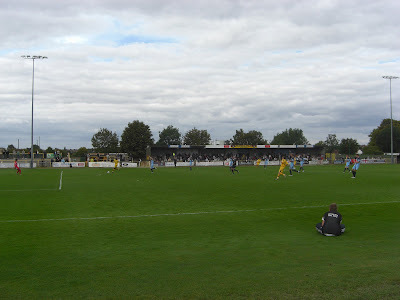 My fifty-fifth stadium of 2011 was on Monday 29th August 2011 at Borough Sports Ground in Sutton, London. The match was Sutton United vs. Dover Athletic in Conference South. Borough Sports Ground (also known as Gander Green Lane) sits just behind the railway line and is only 150 yards from West Sutton railway station. 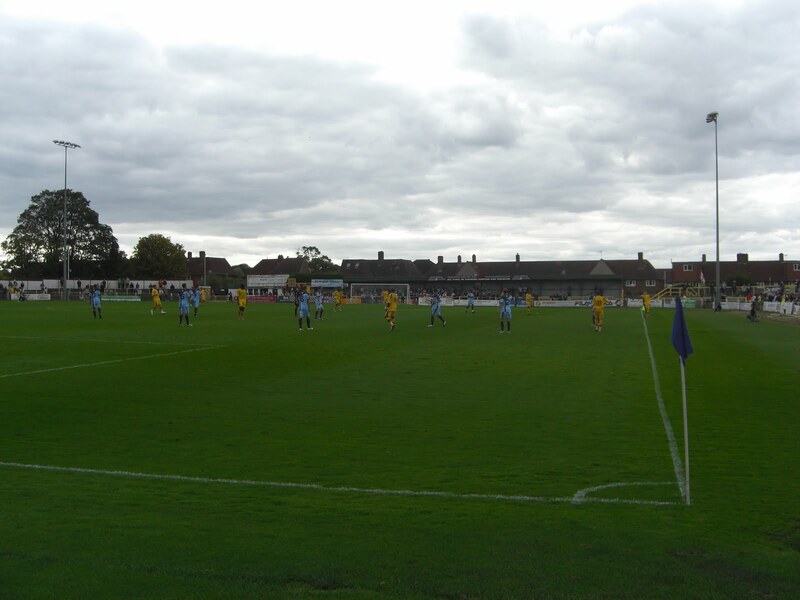 The venue has been home to Sutton United since 1912. The stadium has an unusual oval shape due to the fact it was a racing track before it was converted to a football ground. The effect of this is that fans on the north and east sides of the venue in particular are a long way from the pitch meaning a strong atmosphere is difficult to generate. The Main Stand, which runs alongside the pitch on the south side of the ground is the only all-seater area in the stadium and can hold 765 people. The majority of rest of the ground consists of uncovered concrete terracing which encircles the pitch. The exceptions to this are the two covered terrace structures, one running alongside the pitch on the north side of the ground and one behind the goal on the west side of the ground. These two stands were the most popular places for fans to congregate. Because the venue itself is rather large there is also plenty of free space behind the spectator areas on the north and west sides of the ground. The game started off tentatively with the away side probably edging the first period though it was the hosts who came closes to scoring after a rasping 25-yard drive cannoned off the crossbar just before the break. In the second half Dover started more positively but were kept at bay by some good goalkeeping. As the game advanced Sutton came back into it and in the last 20 minutes they spurned a host of golden opportunities to grab all three points as Dover tried to hang on for the draw. In the end the combination of a lack of clinical finishing and quality goalkeeping meant it finished goalless.